Bijan Bar & Restaurant’s ‘Selera Ibunda’ Ramadan Buffet 2016, Kuala Lumpur. 09 May 2016 23 May 2016 Categories Generalbijan, Bijan Bar & Restaurant, Ramadan 2016Leave a Comment on Bijan Bar & Restaurant’s ‘Selera Ibunda’ Ramadan Buffet 2016, Kuala Lumpur. Close your eyes, imagine the sound of flowing water, gentle breeze fingers through your hair, the soft and subdued light and the delicate smell of food which opens your appetite. Open your eyes, this is not a dream, you are at the Bijan Bar & Restaurant! This atmosphere and the way the restaurant played with the lights, the bamboo blinds and palm trees make this place a very relaxing and chilling place. I immediately felt good and comfortable the moment I stepped into the restaurant, the concept works very well. 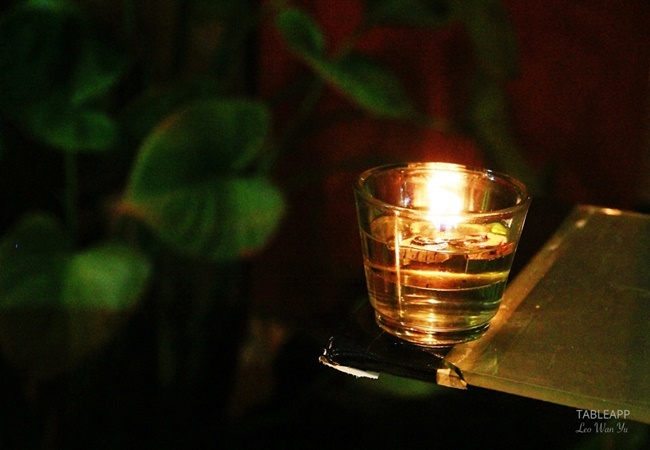 A candle for a subdued atmosphere! Here no one can deny the friendly and jovial atmosphere. Sitting comfortably at your table you will witness a quality service and a smiling and welcoming team. The staffs are always around to make sure everything is going well and that you needed nothing else. 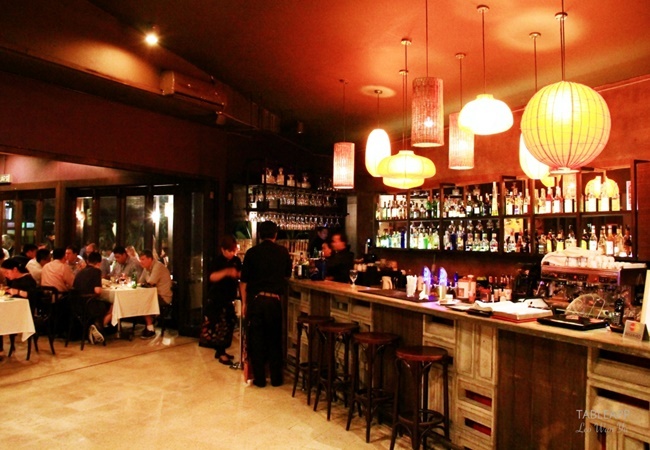 Also, you can appreciate the bar with its lounge atmosphere and its sympathetic staffs. All gathering in this alfresco dining area, I was sitting next to other media that I didn’t know. But it didn’t last long, since there is a very friendly atmosphere we can easily meet and talk with people. This is the perfect place to spend good time either with your family or friends. 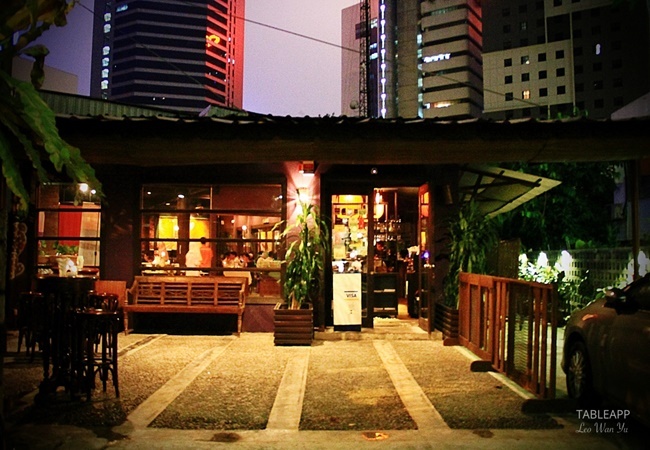 Open since 2003, Bijan Bar & Restaurant acquired a significant and recognised experience in the Malaysian restaurant scene and more precisely in Kuala Lumpur. It has earned a lot of awards. 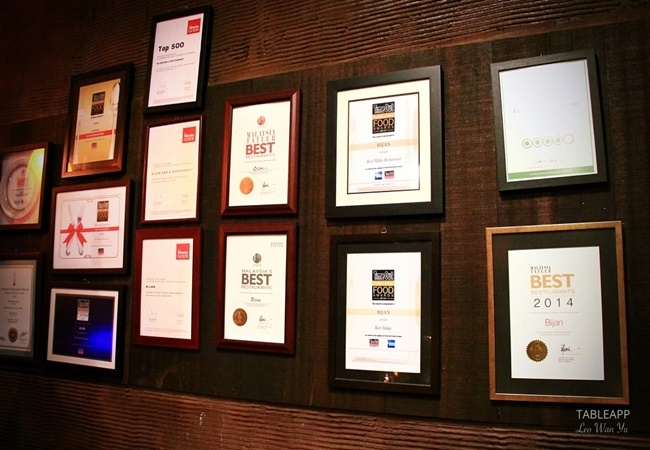 It has won Best Malaysian Restaurant in 2015 awarded by the Malaysia Tatler. But that’s not all; we also find the restaurant in The Lonely Planet Guide to Malaysia, The Miele Guide … and so many others! Hall of fame – a wall full of awards. 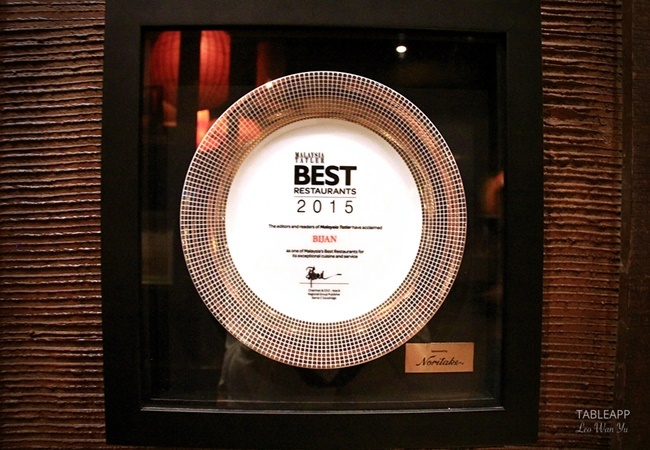 Best Malaysian Restaurant 2015, awarded by Malaysia Tatler. Recommended by most gastronomic guides, Bijan Bar & Restaurant offers gourmet cuisine that highlights local products. 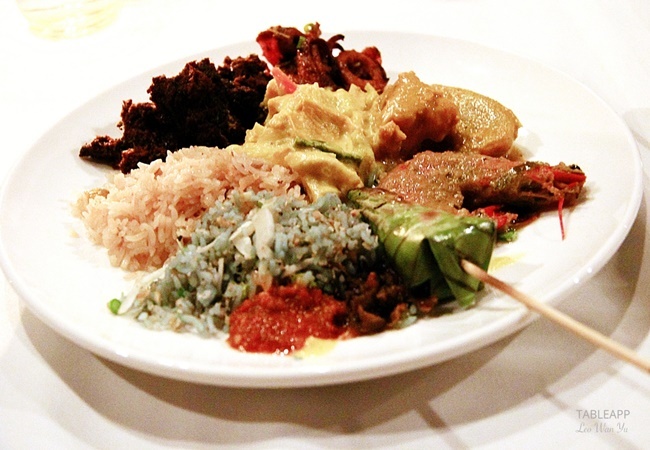 In addition, you will discover authentic and traditional Malay food. The good place for me to start my Malaysian discovery! Bijan Bar & Restaurant has a tradition of serving up a storm every year during the holy month of Ramadan. Similarly this year, Bijan’s Sous Chef Mohd Shawal and his culinary team will be taking diners down the memory lane and stirring up fulfilling memories of some almost forgotten dishes of the yesteryear recipes handed down over the generations. Not forgetting dishes of traditional recipes marrying with modern day ingredients to recreate that once familiar taste, hence, the name ‘Selera Ibunda’ Buffet. This Ramadan, prepare to succumb to the wonderful and generous buffet spread which offers you different and various tastes. Bijan Bar and Restaurant will be having ‘Selera Ibunda’ buffet for this year. A preview of wonderful and generous buffet by Bijan Bar and Restaurant. First, when I discovered the buffet, I was very pleasantly surprised. Unlike France where the food is presented in dishes, here the Bijan restaurant pulls out all the stops. 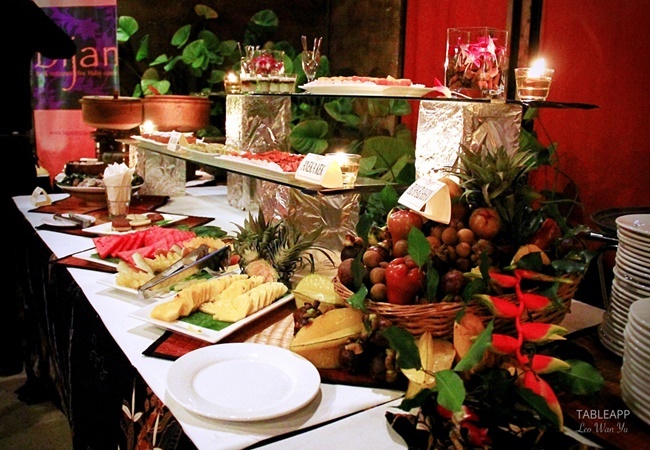 The foods are presented in large and sumptuous terrines, which give a very big charm to the buffet. Starting with the appetisers, you will fall for the delicious Cucur Udang, the delicate Nasi Impit and Sayur Lodeh or even Sata Terengganu, the fresh traditional dish from Malaysian state of Terengganu. 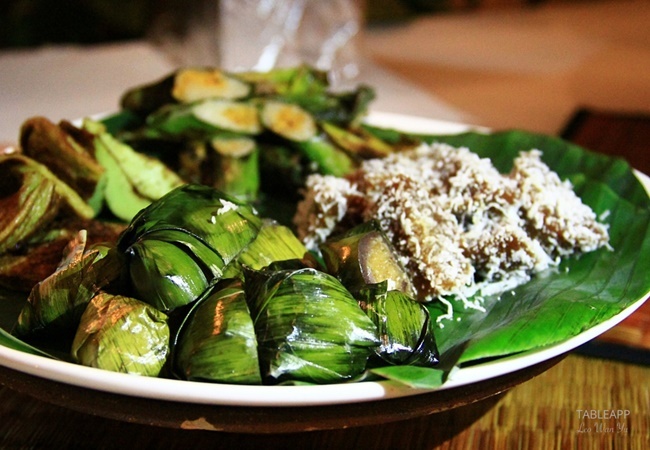 Sata Terengganu consists of spiced fish meat wrapped in banana leaves and cooked on a grill. It is a type of Malaysian fish cake, the main ingredients are grated coconut, sardines, ginger, onions and chili peppers. Good old Malay desserts that will take you down memory lane. Keep going with the grill with the flavourful Kepak Ayam, the tasty Satay Ayam and the generous Satay Daging. Here don’t wait for your dishes to come, stand up, bring the food you chose to the live cooking station and see the cooks preparing your plate under your eyes. Now getting into the heart of the subject, you will certainly appreciate the shrimp and its sauce that Masak Lemak Udang Nenas brings you. This delicate and flavourful sauce made with fresh cream reminds me about French cooking. 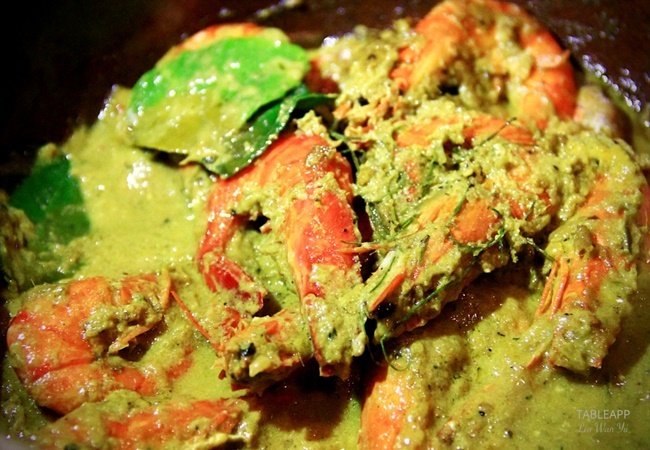 Delicious Masak Lemak Udang Nenas. 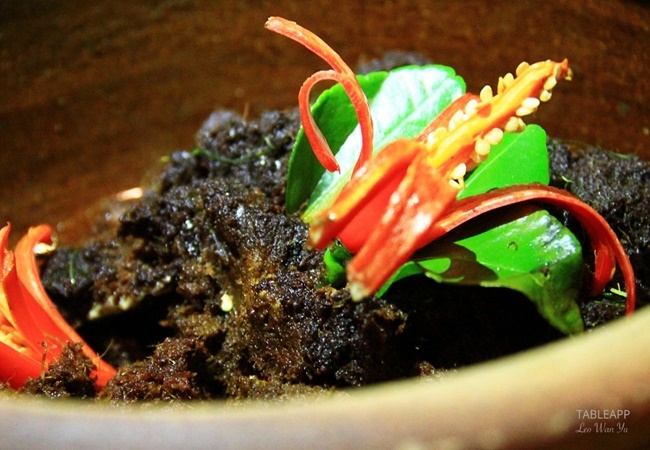 You'll be amazed by the powerful taste of the Rendang Tok Hitam and Rendang Udang. But a typical Malay food wouldn’t be this typical if we didn’t have it with rice, isn’t it? You’ll find the famous and tasty Nasi Kerabu Biru and Nasi Minyak accompanied by tasty Sambal Hitam. This was the first time I saw blue rice, it really intrigued me. Guess why it was blue? It is made with butterfly pea flowers! I find it really creative and original. Then, don’t forget to taste the delightful cooked chicken of the Opor Ayam, you will love it! Nasi Kerabu Biru and Nasi Minyak plate. For the last part, you will appreciate the various desserts that the restaurant proposes to you. For me it was an opportunity to discover tropical fruit that we didn’t have in France. I started with the mangosteen, and I totally loved it, little but very juicy and tasty. This was a great discovery but not the only one. Right after that, I jump to longan. I thought it was lychee but when I taste it, it was more delicate. But you can also finish your meal with the delightful Coconut Crème Caramel and for the fruit lovers you will be served. A corner of delightful desserts for sweet tooth! And not to forget to end the night with a bang – Bijan Bar & Restaurant’s wildly famous signature – Chocolate Durian Cake, created by one of Bijan’s founders, Lissa after being inspired by a chocolate-covered durian candy bought at a Bangkok airport. 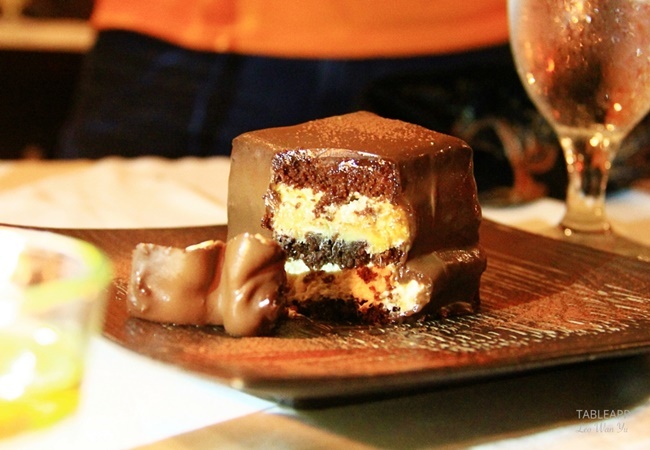 Bijan Bar and Restaurant’s signature – Chocolate Durian Cake. 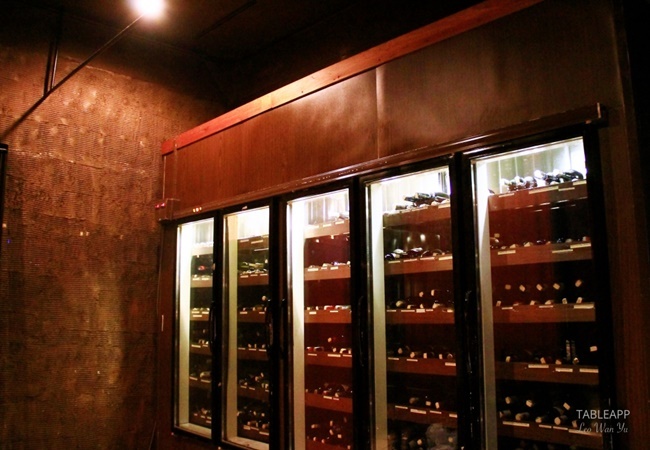 The Bijan restaurant offers a multitude of varieties of wine. Sit back and enjoy a delicious and tasty cup of wine. If you want to taste the flavours and the Malay specialties, you may visit Bijan Bar and Restaurant’s page here. 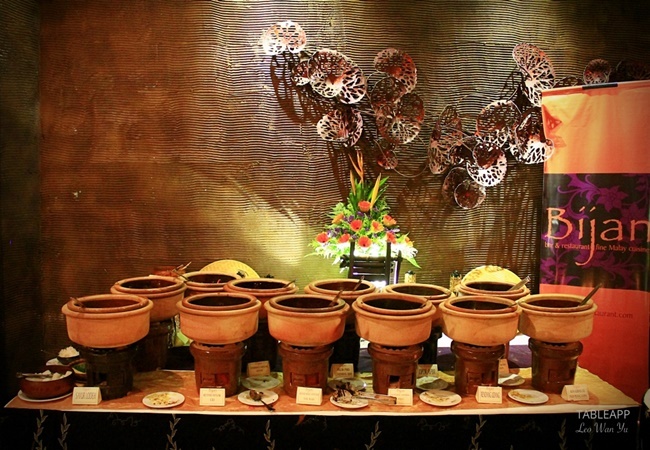 Bijan’s Selera Ibunda buffet spread will be rotating daily with 5 specially tailored menus. 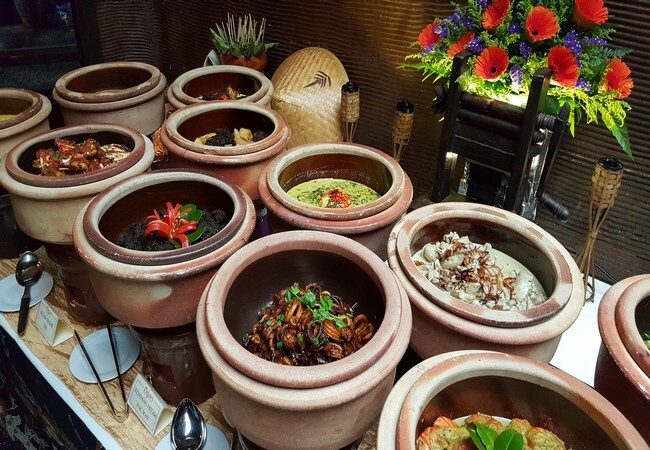 The buffet spread includes grill stations and live cooking stalls that serve the different “panggang” items and many more of other old favourites. This Ramadan buffet will be starting from 10th June – 3rd July 2016, from 6:45pm – 9:30pm, at the price of RM90++ per person. A-la-carte menu is available from 9pm onwards. 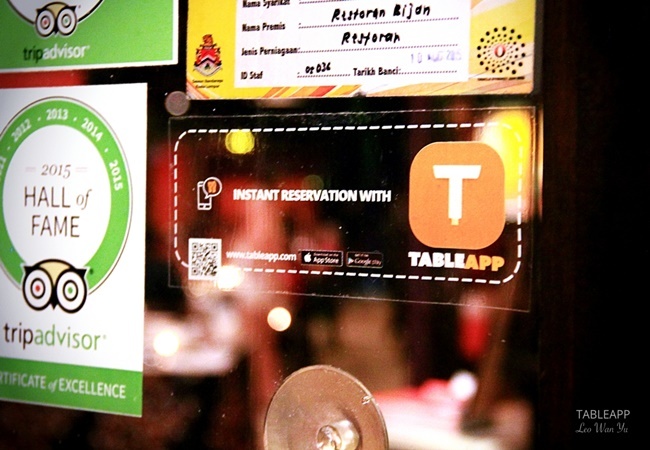 Online reservation is available via TABLEAPP. As the restaurant is wildly successful and widely applauded, we highly recommend online reservation before moving to the restaurant.